Like most people who enjoy TV, I’m following Game of Thrones. Also like most people, I have my favourite Game of Thrones characters, many of whom have died horrible deaths. Thankfully, I still have a couple of favourites left, one of whom is Tyrion Lannister’s sellsword bodyguard-turned-knight, the aptly-named Bronn. Bronn is a secondary character in the series, yet one I’m always excited to watch. This despite the fact that the roguish soldier of fortune – a hard-drinking, womanizing, wry, cunning, yet still reasonably amiable mercenary – is a common high fantasy trope. A morally suspect opportunist, Bronn nonetheless possesses a rough sense of honour and loyalty to Tyrion, if for no other reason than Tyrion continues to pay him (now double since Bronn’s knighting for his role in the Battle of the Blackwater). 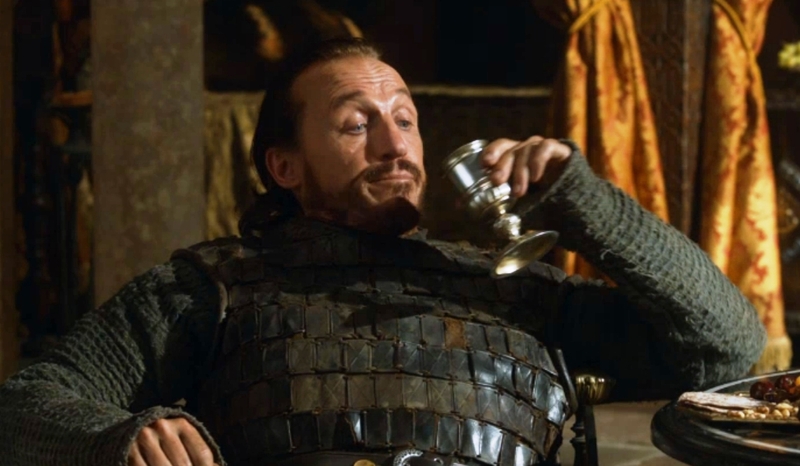 Even though one can tell he’s a highly dangerous fighter who wouldn’t hesitate to cheat, steal, maim, or murder to get his way, Bronn generally comes across as likeable. All the people he’s been shown to kill have either been jerks who kind of had it coming or else he’s done so in defence of Tyrion, an ostensible hero of the story with whom he has such wonderfully sarcastic banter whenever the two are onscreen together. For Bronn, pragmatism is the best tool for solving a problem, such as how, during his stint as commander of the City Watch of King’s Landing, he achieves a significant reduction in crime by killing all the city’s known thieves. Unlike all the other knights of King’s Landing – even after he becomes one – Bronn wears only light leather armour. He relies on speed with his sword and knives and on dodging attacks rather than blocking them with heavy armour and shields, resulting in a fighting style that’s as practical and adaptable as he is. Even though the roguish mercenary is common in high fantasy, it’s a trope I’ve always enjoyed in books and movies, especially when, like Bronn, said characters basically remain decent people just trying to get by in an unjust world using one of the few skills they have, and whom you can believe, deep down, aren’t truly all about the money. I’ve even enjoyed – and still do – female roguish mercenaries; this despite my disdain for the over-abundance of kickass female characters in speculative fiction. The greatest female warrior of them all. Notable female favourites include Kerowyn from Mercedes Lackey’s book By the Sword, Ash from Mary Gentle’s Ash: A Secret History, and the most awesome warrior woman of all, Xena of Amphipolis, aka the Warrior Princess. I loved these characters because, as females, I could see more of myself in them, and what the roguish soldier of fortune trope means to me in real life. For understanding my fondness for it is as much a study of my own character as that I’m conducting into of the character of Bronn. High fantasy mercenaries are hearty and jocular, easily able to win friends in spite of their dubious profession – a profession that allows them to never fear for their safety or have to put up with being disrespected, to choose whom to fight for and the terms under which they do so, to live by their own code and make their own way irrespective of established social hierarchies, and to travel far and wide in the course of their work. To me, this represents a sense of freedom, simplicity, and adventure that I’ve always idealized and desired for myself, even in realizing I don’t fully possess the necessary personality type for such an varied and unstable lifestyle. In my own fantasies of the world and my place in it, much like in high fantasy, one knows exactly who the enemy is, and I myself am not complicit in iniquitous deeds just in the act of trying to meet my basic needs. As well, the environment is spared the onslaught of corporate greed and industrial externalities; I rub shoulders with greatness, offering advice and assistance, without needing to be all that great myself; and a person can become a hero by doing the right thing with resourcefulness, common sense, an intolerance for BS, and without the bother of having to swear allegiance to a ruler who’s probably more corrupt and corrupted than I am. But the real world is infinitely more complicated, and probably always has been, even during the time period high fantasy loves to romanticize. Certainly real medieval mercenaries weren’t such delightful rascals, nor so fortunate a group of soldiers at all, but rather those ill-fated second and subsequent sons who received neither land nor inheritance under a system of primogeniture, and were thus forced to sell their fighting skills abroad to survive. That is to say, being a mercenary wasn’t a lifestyle choice at all but rather a lack of choice that made men so violent, vile, and depraved, the Third Lateran Council of 1179 banned their use by Christian rulers under threat of Excommunication (not that this stopped some rulers). Faced with this reality of history and the world, the true value to me of a character like Bronn – aside from the amusement he provides – is not to mourn a way of life that likely never existed. Rather, he reminds me to remain adaptable, easy-going, and open to change, not hiding behind an unwieldy shield, but eagerly pressing forward toward whatever opportunities may arise. What Game of Thrones characters do you like? Which character trope do you most enjoy? Why? Let me know in the comments. This entry was posted in Character Study and tagged Characters, Fantasy, Game of Thrones, Medieval mercenaries, Medieval times, Real life, The Middle Ages, TV. Bookmark the permalink. Alas, I am the only person on Earth who does not watch Game of Thrones. I know. I deserve the scorn heaped upon me daily. No doubt the show is as fantastic as everyone says, but (as you are aware) I limit my TV viewing and do not find this type of fantasy alluring. That said, the character you describe may be a reprehensible figure by today’s societal norms, but in the context of the time he lives, he’s not so bad. Perhaps one day the human race will evolve into thought beings incapable of violence and who are infinitely accepting and free from judgment. They would look upon us as base, vile creatures, nonetheless capable of showing goodness and character under the right circumstances. Game of Thrones is the only show I watch, so I’m constantly scorned for not watching Mad Men/Breaking Bad/The Walking Dead/Sherlock/Dr. Who etc, etc. I think in every age, people exist on a spectrum from reprehensible to utterly admirable (with most people somewhere in the middle, as in most spectra), although what defines each endpoint is constantly changing (hopefully in a more enlightened direction). The problem with most of the worthwhile shows is the necessity of watching from the beginning. I guess that’s what Netflix is for. Sherlock only broadcasts three episodes a year, so that might be doable for those on a tight schedule. Seriously? All that hype over three shows a year? Like Eric I’ve not watched the TV show (to be fair I did watch about half of season 1 but I found the violence and almost permanent tension too much. Didn’t help that we’d just had our second kid and I was getting squeamish about things with kids in them. Must be getting old). I’ve only read the books up to number 4 (really lost interest at that point), but by far my favourite character was Tyrion. Partly because of he seemed to get all the best lines, but also because I felt like he was resisting fitting in by constantly figuring out ways to fit in according to his own moral code. Deep down parts of him seemed similar the depraved and cruel souls around him – he was at heart a Lannister – but he seemed to want to struggle against his nature. To be something better. Yet he could only do that if he found a way to survive in the world of the depraved and cruel. I’ve always enjoyed characters that find ways to stick to their own codes in the face of adversity, even if they bend and come close to breaking. You’ve read much further than I did, in any case. I read book 1 and half of book 2 long before the show even existed (geez, how hipster did I just sound there? ), but bailed because I wasn’t fond of GRRM’s portrayal of women nor the shifting POVs. I like Tyrion as well. He’s a great anti-hero, and a large part of my enjoyment of Bronn’s character is due to the interaction between Tyrion and him, almost like some sort of medieval buddy flick. I don’t know all the characters all that well just yet or what their game is. I came in at season 3, and will have to be a hermit one of these days and plow through seasons 1 & 2 so that I can get the skinny on everybody. Most definitely my favorite character to date is Tyrion. Peter Dinklage plays his role with such eloquence. I suppose too, I have always been drawn to characters who, despite their obvious disadvantages in life, seemingly rise above and display that rare form of humanity that surely must have been difficult to find in such times. Not that he isn’t a cad, he is and a smart one at that too. In all fairness, I’m not well enough acquainted with Bronn’s character to comment. I am more familiar with Daario who championed Calista (don’t know if the spelling is correct) last night. I like the dynamic they are building. I love the role of Brienne. She just rocks it for me. Again, she carries herself with such grace and humility. Only time will tell if she becomes the character I am anticipating. I haven’t read the books, nor will I as I am finding the seasons delightfully surprising. I appreciate the graphic nature the show, while yes, it is very violent, I have no doubt that the depiction of such a cutthroat world may well have existed in some context considering what we know of the methods of killing that humans have come up with. I enjoyed the character of Nakita played by Peta Wilson back in the 1990’s. She was a hardball character in a hardball world. I did enjoy Xena as well. Lucy Lawless was excellent in the role. It would be good for you to catch up for the sake of continuity, but I think one could get the basic gist of what’s happening coming in at season 3. I agree that Tyrion is a great anti-hero, and as I was saying to Mobewan below, a big part of my enjoyment of Bronn’s character is how he and Tyrion play off each other. Good fun! I like Daario as well. I would categorize him as a roguish soldier of fortune as well, albeit one closer to the “good” end of the spectrum, while Bronn is more neutral, Sandor “The Hound” Clegane is more bad, and Sandor’s brother, Gregor “The Mountain” Clegane is really bad. I don’t really care for either of the Cleganes. I absolutely love Daernerys (Khaleesi). It’s been amazing watching the growth of her character and her coming into her power – and all without the sacrifice of her feminine qualities. Brienne is an interesting character, but I find her just a bit too dour (albeit rightfully so given her situation), so I don’t enjoy her quite as much. I used to watch Nikita as well. The relationship between her and Michael (how opposite she was in that regard compared to in her work) was always so fascinating to me. 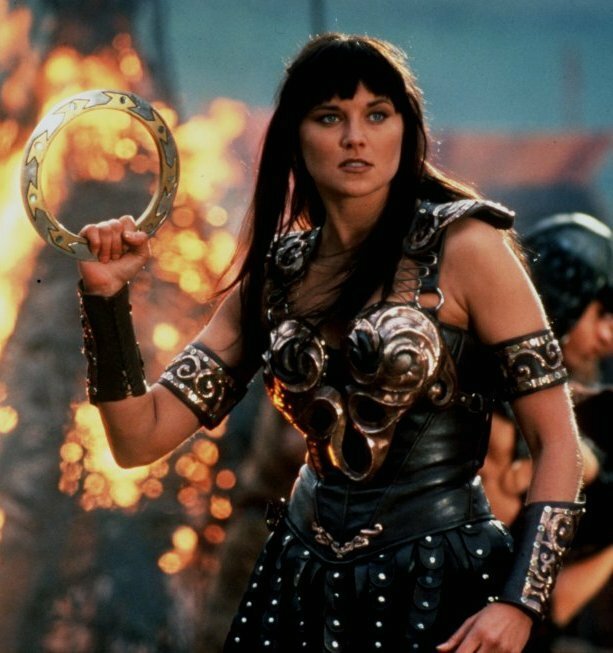 And Xena – Xena is one of my favourite fictional characters of all time. That show has inspired me as a writer, a person, and a dreamer. I’d love to comment, unfortunately, I haven’t managed to see Game of Thrones. It’s on my list to get my hands on. Good character study, though. Have you ever read Tamora Pierce? She writes strong female characters and some mercenary characters that are beautifully thought out and conflicted. It’s more Y/A but I enjoy her work thoroughly. Genres are just suggestions! I totally read Tamora Pierce when I was young. I actually think it was the Song of the Lioness was the very beginning of my fondness with for female warriors. I haven’t read any of her other titles, though; are there any you would recommend?